Today’s post is a short one, friends. My day at work was filled with lots of hustle and bustle for a big upcoming event. I was crunching numbers, making schedules, assembling instruction packets and doing 4,000 things at once. It was a lady bug. A pretty little lady bug that came out of absolutely nowhere in the depths of the winter cold to present itself to me on a Monday morning. 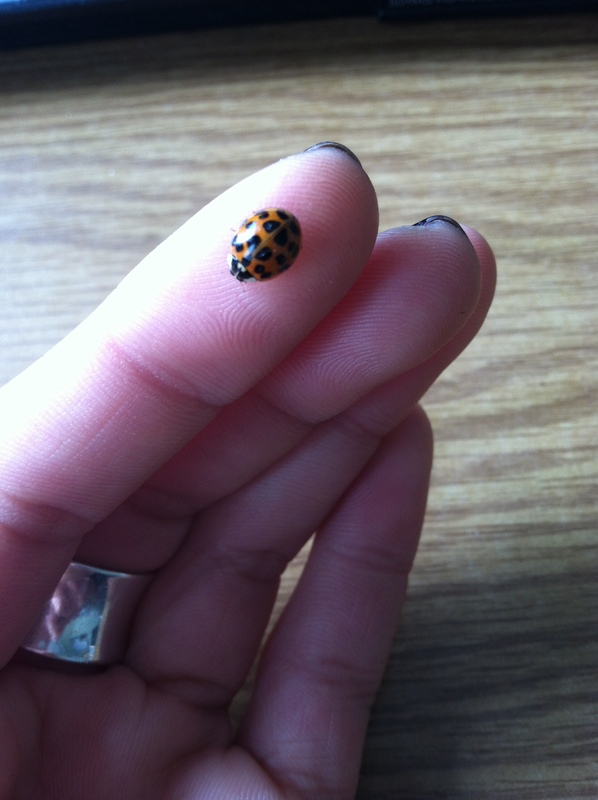 A little too eagerly, I picked it up and hoped that some of the lucky ladybug magic would rub off on me. We all know that I love my positive signs and motivational sayings and quotes. What could be better than a real, live good luck charm that came right out of the blue and landed on my desk? Everything’s going to be juuuust fine. Thanks, little lady bug. I needed that! This entry was posted in Random and tagged Good Luck Charm, Happiness, Ladybug, Luck, Motivation by 5ksandcoffeebeans. Bookmark the permalink. Haha = ) I know! I Was thinking the same thing, I think that’s why it shocked me so much!